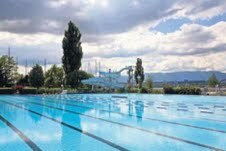 It takes motivation to go to the public pool at Geneve Plage and swim two kilometers and a half. I find many motivators without which I would renounce to the endeavor. The first one is that I have to be a role model to my eldest, and to a lesser extent to the younger ones. They know that their mom and big brother go swim for an hour a day. It will compute eventually. They should think its the norm. I have to induce my eldest to keep swimming as it is the sport he elected. "Just do it, I tell him. I will come with you. I will swim as well." The second one is that swimming is my summer fitness routine. I am not a runner, nor a biker. I have abandoned pilates and yoga and decided on swimming every summer. It is a resolution that I have to follow through. The third one is that I am a nagger. I say I won't swim in a pool smaller than 25 meters. 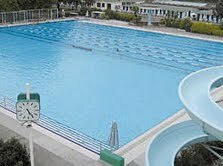 Well, here in Geneva, at a stone throw away from home, is a 50 meters Olympic size pool. Swim for all the laps you have refused to swim stobbornly in the 15 meter pools! The fourth motivator is to tell the world you are about to swim the length planned and then stick to the goal. Otherwise your credibility is at stake. The fifth motivator is to remember that sports runs in the family. Your sister bikes daily, your brother can bench press more than his own weight, your husband and younger brother are very good runners. They accumulate more kilometers than you can swim in a week. If I looked at the generation before me, the swimmers and golfers on the paternal side and the skiers, tennis players, climbers, kite surfers on the maternal side, I would feel a fool not to swim. Those five motivators get me to the pool. Get me to argue with my son till he finally agrees to swim the selected distance. All the way there, I have to motivate him. Pep talk him: tell him that Andre Aghassi hated tennis and played daily, tell him that Roger Federrer's tennis might look smooth but it actually takes a lot of work and practice, tell him that Vladimir, the Olympic swimmer in his team in Dubai swims daily. I try not to talk about Phelps because he knows his mother is strict and he doesn't need to be reminded of that. I touch the water with my toes. Feel the temperature. It is bearable. The outside temperature is comfortably high and the sun is shining. Get in. Swim your distance! I have jumped in. I start counting. Now I have to pep talk myself! I remind myself that I have been swimming for three decades. That it was the most valuable sport I learned in Salt Lake City. That I swam at camp for three summers, in the freezing and daunting Lake Chaplain in Vermont. That I even swam while I was overweight at Smith College. That I swam through 3 pregnancies! I am in the lane with the endurance swimmers. The fittest fish in the pool. I have to keep up with them. Besides I am swimming against the clock. I want to be out of here in good time. Get out of the pool and lay on the grass and have some sweet fruit. As I swim, I try to convince myself that this is less torture than bikram yoga. I am not fully convinced. I switch to thinking about pilates and agree that swimming is also an all body integrated sport. 30 lengths through, I feel my shoulders, my abs, my wrists and my ankles. I know I have to articulate my kick from the sit-bones. My son swims ahead of me with fins on. It is good for his kick and he gets out of the water before I do. I don't count lengths for him. If he has swam 40 lengths instead of 50 it is good enough for a eleven year old on vacation. I have encouraged him to set high standards. Like Vladimir who swims for his country or Federrer who plays for Switzerland at the Cup Davis. Why not aim for the Olympics, I suggest? Time will tell. Till then, its the journey that matters, all those laps in the pool. Happy Birthday Abu Torab! We're so proud of everything you've achieved and more. May you always look forward to many more achievements in life! Most important, we're very lucky to have you as our beloved nephew and cousin. We love you so much! The blogger is a Nagger,stalker,boxed in a square without a possibility of rounding the edges.She's famous for her uncompromising positions though she had reached the highest degrees of political education.I thought politics was the art of compromise? Yet on the 11th anniversary of her eldest boy,she's is an uncompromising mom in her sacrifice,dedication and infinite love to her family.She is the best example to confirm: paradise is under the feet of mothers. Happy Birthday ATA: you got the mom you deserve,and other kids wish they had. Setting an example for your children can't be done by mere talk.You have to sacrifice so many temptations and show them how you live on daily basis. children are the most observant creatures,and their character is formed at an early stage in their lives.You build up credit with them,when you set an example of life style and action.